What is The Very First Indication of Alzheimer’s? You are here: Home / health tips / What is The Very First Indication of Alzheimer’s? The question is: when did Mrs. Dell initially begin developing Alzheimer’s? Most people think the problem of Alzheimer’s is something that starts around the age 65 and progressively becomes worse as you age. Reports and studies now reveal that the initial cellular damage in the brain begins twenty to thirty years before the first symptoms start to show. Recent advances in brain-imaging technology give us new ways to see what is going on inside your skull. A basic understanding of what these studies show will make it easier for you to realize there are certain factors you can control to help prevent such a dreaded disease as Alzheimer’s. There are no medications that will cure the disease. There are no pills you can take that will prevent the symptoms from happening or even to stop the progression of the signs once they have begun. It is imperative that you at least know what steps you can take that will help avoid or delay the beginning of the most dreaded disease we have. And even if symptoms have begun, the same lifestyle changes will help slow or halt the progression. Now is the time to realize what role the foods you do eat and don’t eat play in Alzheimer’s. Also, whether you exercise or not as well as your weight. 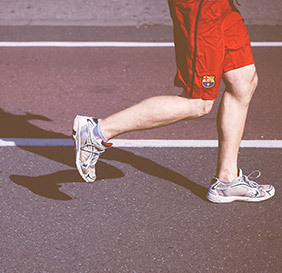 Understanding the specifics of these lifestyle factors will help convince you that there are certain lifestyles you will emphatically want to embrace, as well as certain factors you will run from as fast as you can. There is no pill you can take that halts the progression of what is happening. There is no known way to reverse the symptoms of what has already taken place in your brain. However, today there is hope. Controlling certain lifestyles is our only hope for prevention of it ever happening as well as slowing or halting the progression once it has begun. 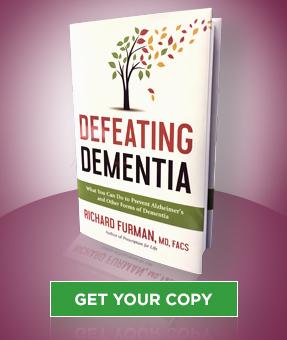 Defeating Dementia explains what you can do to fight these factors to significantly decrease your odds of getting Alzheimer’s or slowing the progression even if you are already having symptoms.